A Taste Of North India: Aloo Matar Kulcha - Simply Fahad-istic! "The smell of good bread baking,like the sound of lightly flowing water,is indescribable in its evocation of innocence and delight." Great debate exists over the difference between naan and kulcha.Particularly because both taste almost the same.Over the years I have heard several theories like naan uses yeast as the leavening agent,whereas kulcha uses baking powder and baking soda,and so on.However,irrespective of such traditional differences,modern day restaurants make naans and kulchas with the same dough.Puzzled by this surprising discovery,I asked a Tandooria(Of the last restaurant I worked at.) what exactly the difference between these two flatbreads was.His reply was even crazier.For one,naan is usually flavored with nigella seeds,kulcha is not.Secondly,naan is given a teardrop shape.Kulcha,on the other hand,is round.Silly,but true.These are the only dissimilarities between restaurant served naan and kulcha. 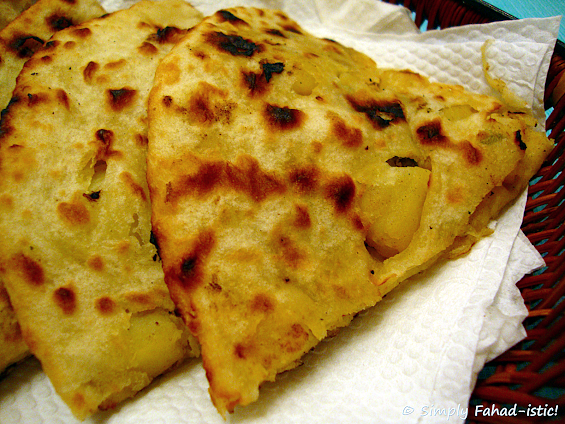 Now,some kulcha making tips for you.Firstly,unless you do not eat onions for religious reasons,adding them to the filling is a must.The filling may be anything - potatoes,cauliflower,etc.,and onions would keep it moist.For this very reason,some Indian cottage cheese(paneer) has been used in this recipe as well.The quantity of the paneer is small enough to ensure that the preparation does not become aloo matar paneer kulcha,yet large enough to give it adequate moistness.The fresher the paneer,the better.Secondly,chaat masala often does not work in recipes.It consists of spices that a preparation usually contains anyway,like pepper and cumin seeds,and hence becomes harsh on the palate when used.The secret ingredient here is podina churan.It may sound unusual,but works like magic,specially since the mint in churan complements the potatoes and peas in the stuffing. Serve this bold bread with dal makhani or butter/makhani gravy for a celestial experience. Did you know?17th November is Homemade Bread Day! In a large bowl,sieve together the dry ingredients of the dough - refined flour,baking powder,baking soda,caster sugar and salt. Now,holding the tips of your fingers and thumb together,put your hand in the center of the flour mix and move it in a clockwise or anticlockwise motion,to make a well.Fill this well with yogurt and milk. Gradually draw in the flour mix and combine the dry and wet ingredients nicely.Sprinkle sufficient water(120-200 ml) and turn the mixture into a soft,supple dough.Knead until smooth.If you find it easier,take out the dough from the bowl and knead it on a lightly floured surface. Cover with a moist cloth(should not be too wet) and keep aside for 10 minutes. In the meanwhile,rub dried fenugreek leaves between your palms and put them in a bowl.Doing so releases their flavor.Tip in the rest of the filling ingredients except for salt and pepper.Mix well.Now,taste for seasoning and adjust the salt and pepper.Remember that both the potato and the peas have been boiled in salted water.Podina churan and chaat masala have salt too.Similarly,we have added green chili and red chili powder for heat,and you may not necessarily like any pepper.Chaat masala contains pepper as well.Mix very thoroughly once again.Set aside. Once the dough has rested for 10 minutes,pour oil over it and knead again,until the oil is completely absorbed. Cover with the moist cloth once again.This time around,let the dough rest for an hour. Then,pre-heat the oven to 230 degrees C/450 degrees F/Gas 8. As the oven pre-heats,divide the dough into eight to ten equal portions.Divide the filling too,into the same number of portions. Form the portions of the dough into balls. Take a ball,flatten it using your palms and fingers till at-least twice its original diameter.Place a portion of the filling right in the center,gather and seal the edges,and form a ball again.Dust the ball with some refined flour,and roll into a disc using a rolling pin.Alternately,you may use your hands.Repeat until all the dough balls have been rolled out. Transfer to a baking tray.Place the baking tray in the oven,and bake for 5-6 minutes. Remove the ready,hot,subtly sweet on the outside,spicy and flavorful inside kulchas from the oven carefully,and cut each into quarters.Apply white butter.Serve.Food doesn't get any better than this! 1. While many people prefer mashing potatoes(by hand) for their kulcha stuffing,I personally prefer the smoothness of grated potatoes.Potatoes that are mashed provide a more varied texture,but here we have ingredients like roughly mashed peas and chopped onion for additional texture anyway. 2. While considered unimportant by some cooks,the process of sifting/passing through a sieve serves multiple purposes - from mixing the ingredients to aerating them,and so on. 3. If you are making kulchas for the first time,divide the dough and the filling into at-least ten portions.It is easier to work on smaller kulchas,to start with. 4. Often,chefs at restaurants/dhabas use equal quantities of dough and filling.For example,a dough ball weighing 125 gm is stuffed with 125 gm filling.However,rolling out the dough with so much filling takes practice. 5. 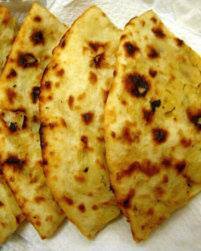 For a more browned surface,you can flash the kulchas under a hot grill for a few seconds,after they have been baked. 6. If you don't have an oven,kulchas can be cooked in a gas oven tandoor or electric tandoor. Omit the filling to make plain kulcha.